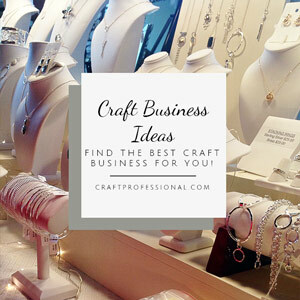 The need for good craft business management strategies and tools often sneaks up on you. You make a few treasures, sell them at a show or a home party, or online, and with some smart and hard work, your business grows. Suddenly, you find yourself in need of a way to manage this new business you have grown. Putting an effective accounting and bookkeeping system in place for your home craft business is a central factor in good craft business management. It's absolutely crucial if you want to know how much you are making, how much you are spending and avoid pulling out your hair at tax time. A good accountant can give you financial advice specific to your local business laws. Financial management software can help you to see where you're spending money and where you're making money. Your local business development center can be a great resource for getting started on finding local resources for putting together organized books for your small business. Get rid of that old shoe box full of receipts, get organized and you'll be happier and your business will be healthier for it. Please keep in mind that although articles on this site are carefully written and researched, I am not an accountant, or a bookkeeper or a lawyer, so any information on this site is not intended to be legal advice or to replace the advice of professionals. Please use your best judgment to determine for yourself when you need to consult a lawyer, accountant or other professional. The process for registering your business will vary depending on where you live and how you want to structure your business. 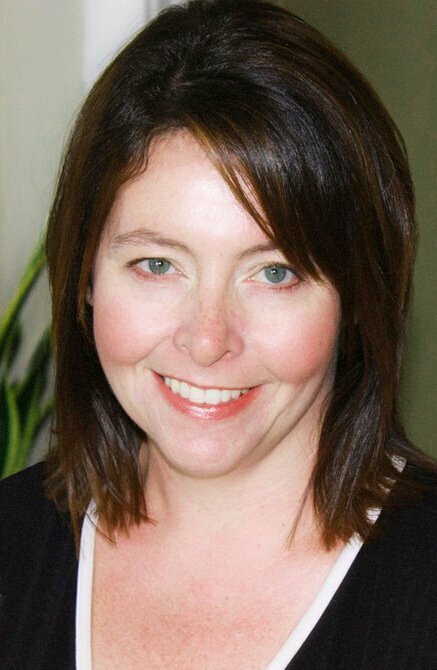 Staff at the business development office or chamber of commerce in your area will show you exactly how to get started. In my own experience, registering my business was a lot easier than I expected, and it opened up a lot of doors that would not have been available otherwise. Registering your business gives you the ability to buy supplies from wholesale suppliers in your industry. Wholesalers typically sell for about half the price of retailers and have better selections than retailers, so it's pretty important to most craft business to have established wholesale accounts with wholesale suppliers. Your ability to effectively manage your inventory can have a big impact on the success of your business. On one hand, you'll likely want to be frugal and won't want more raw materials and finished products on hand than necessary. On the other hand, you have to have supplies and finished products on hand when you need them and when customers want to buy them. Handmade work is unique in that you will have to factor in a significant amount of time to produce your art or craft if you need several pieces to sell at a specific venue. That can really complicate inventory management. Good craft business management includes taking time to estimate when you'll need raw materials and finished products and how much you'll need. Using some kind of tool to help you determine when you will need inventory and raw materials can be a big help in your craft business management process. If you're comfortable with Excel, it's a great tool for setting up a forecasting tool. A forecasting tool can also help you to manage inventory, plan production times and make effective craft business management related decisions. Establishing a merchant account so you can accept credit cards is an important decision. It is not difficult to establish a merchant account. It does take a bit of research to determine which company and type of account will be best for you. Some plans make more sense if you're starting out and have few transactions, others are more cost effective if your home craft business is growing and you're making plenty of sales and have plenty of credit card transactions. It can take some time to get your account established, so don't leave it to the last minute before a big craft show. Being able to accept credit cards will go a long way to helping you increase sales in your art based business. There are certain tasks that are required when running a home craft business that, depending on your work preferences, can become tiresome and time consuming. Often they are necessary but don't feel very productive. For me, it's the administrative type tasks that get to me. Photographing my jewelry and making tags to describe each piece always feels like a big, but necessary drain on my time. The more you can make decisions that streamline the time consuming, but necessary processes (like photographing a lot of your work at once), the more time you'll have for all other aspects of your business. 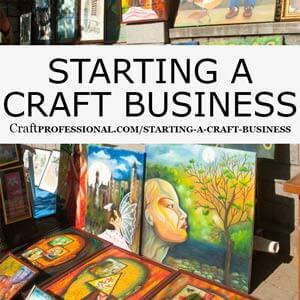 It's easy to get ahead of yourself when building your home craft business. You read small business success stories or look at other artists you admire and want to be where they are immediately. Keep in mind that good craft business management includes realizing that it takes time to build a business from the ground up. If you dive into too many projects at once, you won't have time to commit to making them all successful. Carefully choose the direction of growth you want for your business and focus on that until you have it up and running before you jump into something else. I'm a huge fan of developing multiple streams of income. If your business relies on one primary source of income, in my opinion, it's in a risky position, and that's not good craft business management. So, while it's important to stay focused and develop one aspect of your business at a time, as you grow your home craft business, keep in mind that if you can establish several sources of income, your small business will be more resilient to market changes that are outside of your control. 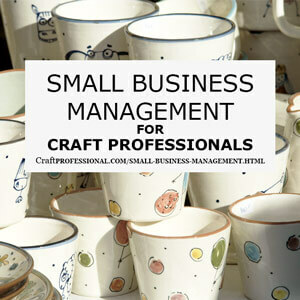 Taking the time needed to develop good craft business management processes will be beneficial to the health of your small business and help you to continue doing the creative work that you love. Launching your business? Start here. Management strategies for your creative business.